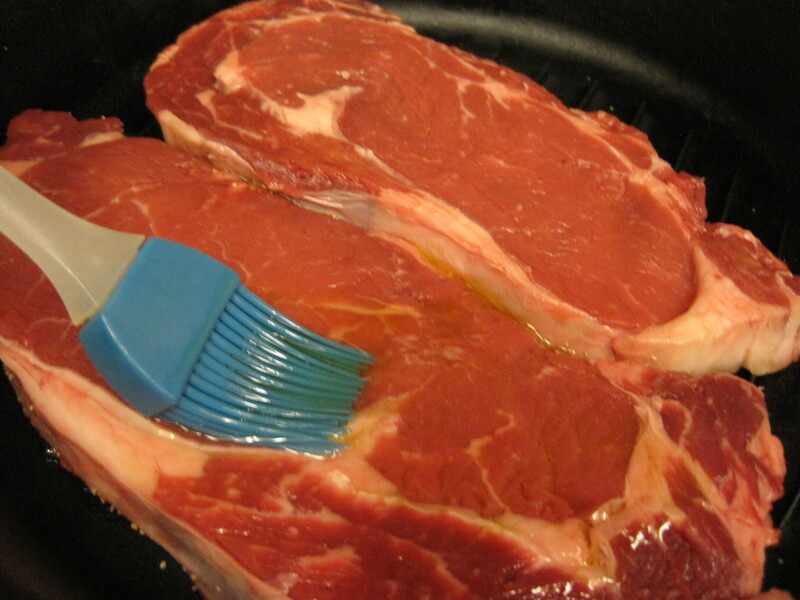 When I was growing up, we didn’t eat steak very often. When we did, however, it wasn’t something that I really enjoyed. My mother liked her steak well done. She didn’t like any pink to show. Unfortunately, frying tender and juicy steaks that met this criteria was not a skill my mother possessed. Even attempts to cook high end cuts of steak resulted in something that more closely resembled shoe leather than a piece of meat. Don’t get me wrong–my mom was generally a good cook. She made great Swiss steaks, but most of the meats she cooked were either roasted or boiled. In all honesty, I never really liked steaks, and since they were expensive, I considered my dislike of them to be good for my budget. 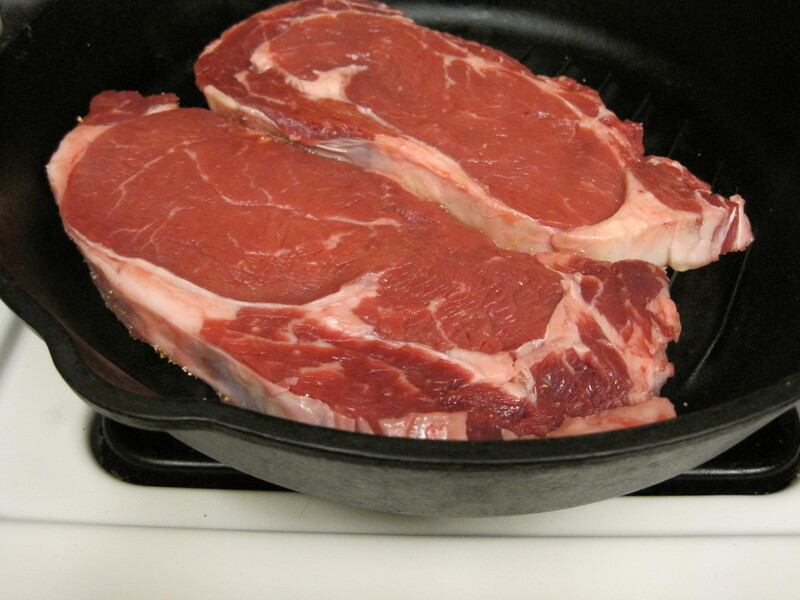 I was fortunate when I married Baker’s Man because he wasn’t really a steak and potatoes kind of guy. Back in our starving college student days, one of our employers took Baker’s Man and me out for a steak dinner. Honestly, we weren’t very excited about it, but when the steak was served, it was tender and delicious. 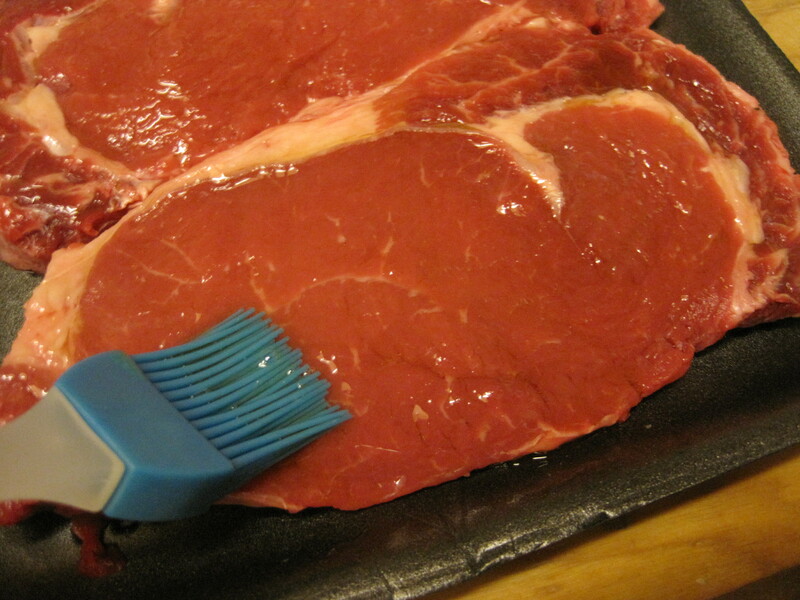 It possessed none of the shoe leather qualities that I had come to expect from steaks. We actually enjoyed it. Unfortunately, due to our starving student status, we were unable to afford steaks as part of our grocery budget. Fast forward several years. We had enough money to afford steaks, but unfortunately I didn’t possess the skill required to prepare anything that wasn’t reminiscent of my mother’s shoe leather. I tried several techniques over the years, but was never successful until a friend shared a secret that one of his friends had shared with him. 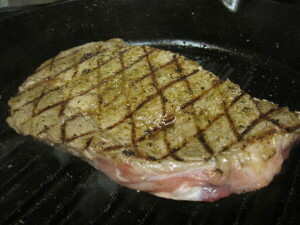 The secret to a perfect steak, he told me, is a very hot cooking surface. 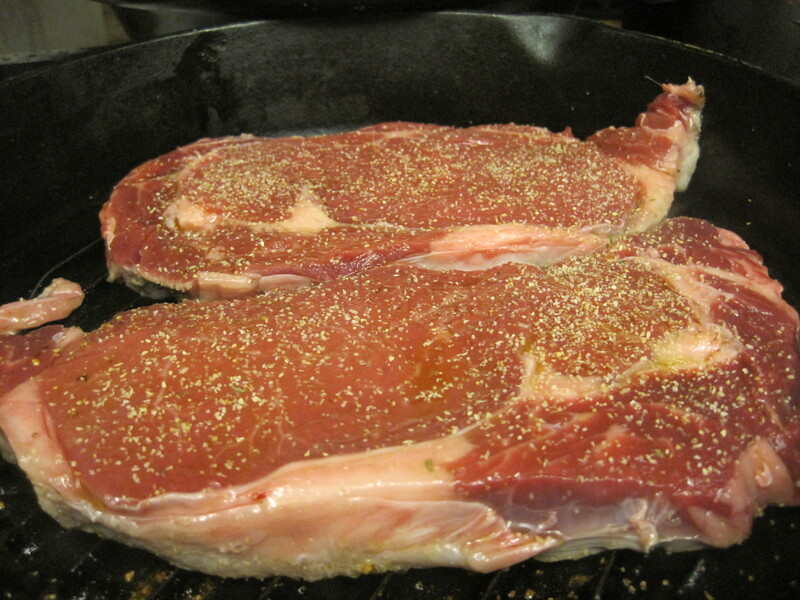 The cooking surface must be heated to 500 degrees F. I usually use cast iron for this because I don’t think that other surfaces can tolerate such a high temperature, and I know that Teflon coated pans heated to those temperatures have been reported to release toxic fumes. Heat your grill or skillet to 500 degrees F while you prepare your steak. 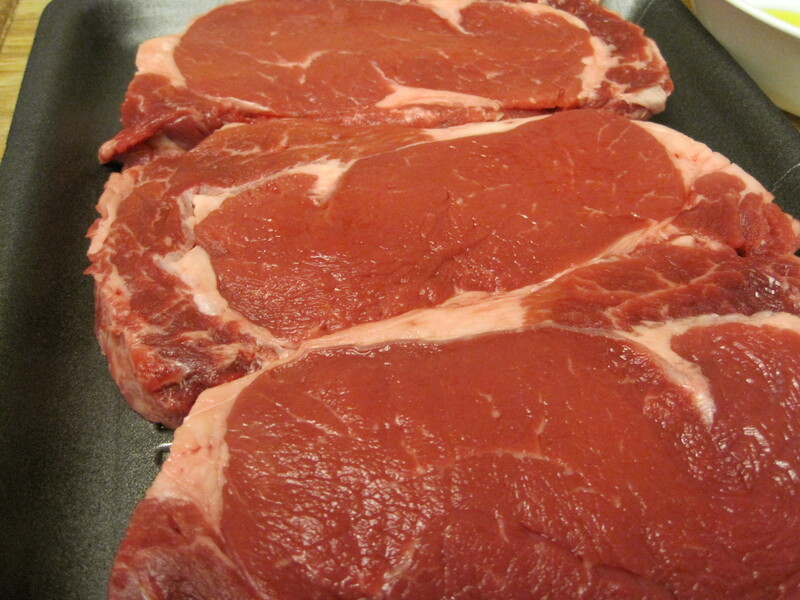 In this case, I was using 1 1/4″ thick rib-eye steaks that were on sale at my local grocer. Brush the surface with a light coating of olive oil. 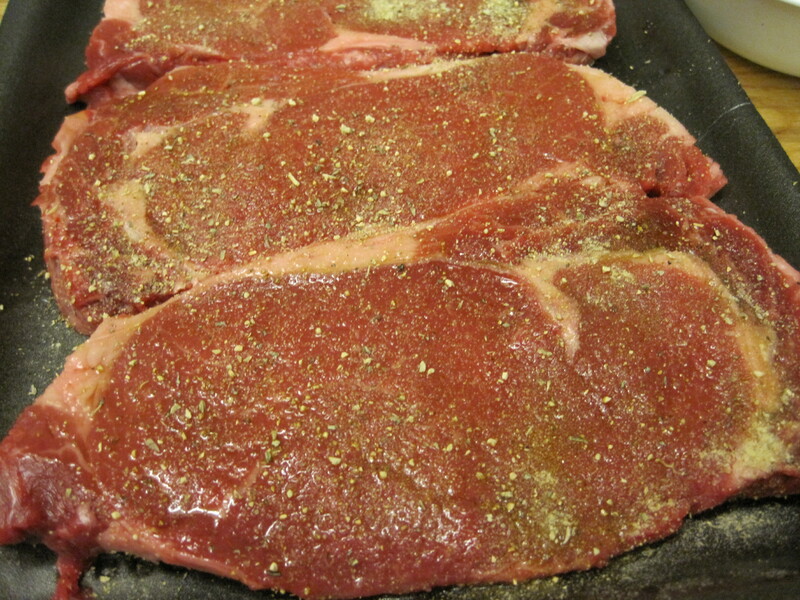 Sprinkle the oiled surface of the steak with your favorite seasoning. I prefer a combination of garlic and onion, but sometimes switch things up depending upon what I’m planning to serve as side dishes. While the first side sears, brush the other side with olive oil. 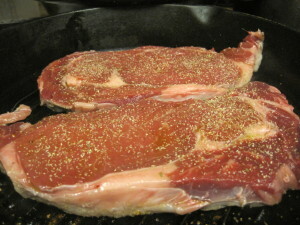 Apply your seasoning blend on top of the olive oil coating the second side of the steak. 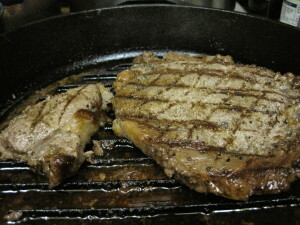 At the end of two minutes, the steak is flipped and the other side seared. At the end of the next two minutes, You can do one of two things. 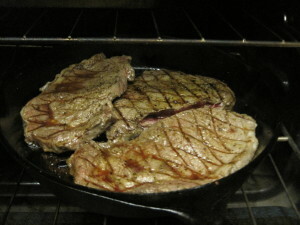 Remove the steak and place it into a different pan, or remove the skillet containing the steak from the stove and place it into a 350 degree oven for 10 to 20 minutes depending upon the thickness of your steaks and how you like them. Obviously, you want to use an oven safe skillet if you do this. Since I use cast iron, it’s not a problem to put the whole thing into the oven. Twenty minutes in the oven produced a tender and juicy, well done, steak with no pink showing, just the way my mother liked it but without the shoe leather consistency. A few years ago, I prepared a steak this way for my mom. She loved it. For days, she raved about what a tender cut of meat I purchased. It wasn’t the cut of meat. It was the technique used to prepare it, but I didn’t tell her that. I have used this technique with sirloin, filet mignon, and rib-eye. No matter what the cut of meat, it always comes out perfect. The only down side to doing this in the house is that sometimes, the hot skillet sets off my smoke alarm as the steak sears if I don’t remember to turn on the exhaust fan over my stove. If I grilled it outside, that would never happen. 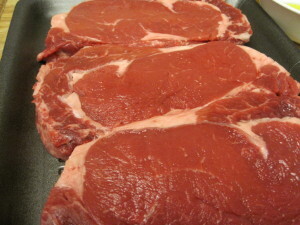 Please give my friend’s secret to a perfect steak a try and post a comment to let me know how you like it. If you have a technique that works better, please share that, too.